The Travo is another famous Corsican classic. 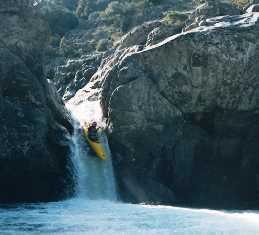 If the Vecchio, by presenting us with three excellent, different sections of river, provides the best total length of river water in Corsica, then the Travo must arguably provide the best single stretch of river for a one day paddle. The amazing set piece on this river is the famous group of three waterfalls, of 6, 7 and 2 metres respectively, all stunningly situated in a massive circular ampitheatre of natural rock. 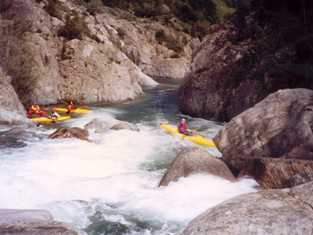 But unlike the Rizzanese and it's drops, the Travo also has a lot else to offer in addition to free fall water-slides - 6 kilometres of difficult gorge running at grade 7, and a secluded corner of Corsican scenery well away from the noise and civilisation on the coast only 10 miles away. The Fium Orbo is a long drive from the major river valleys of the Golo, Tavignano and Liamone. 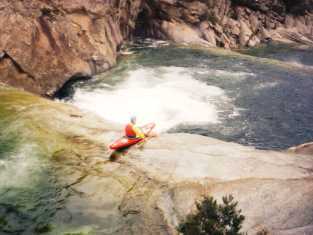 Nevertheless, for the paddler happy on grade 5-6 water, a day or two spent in this scenic valley will be well worth while. It is not too far from the Travo to be included as one "family"
The best approach to the valley is from the top end, crossing the Col de Sorba from Vivario. If this drive can be timed to coincide with sunset on a cloudless evening then the trip will have been worthwhile even if the river is empty. The alternative road into the valley is from the coast. Unfortunately this takes you past the site where the guts are being ripped out of the lower Fium Orbo valley to build a huge hydro electric complex. I know that in these days of the greenhouse effect we should support renewable energy, But that still does not stop the shock of seeing the destruction of one of Corsica's valleys. It is a depressing sight. Hopefully as the years go by landscaping will improve the view. The normal start point for this section is the bridge one mile below Chisa. This is private land, so be careful, but the owner seems to have become used to canoeists launching at this point. The river above this point is apparently canoeable, and was used for filming the "Family Mad" videos. (We became aware of the film crew's presence when the cameraman zoomed past our camper-van, desparately trying to control his skateboard, which was being powered by a 10cc model aircraft engine. A real case of boys with their toys). 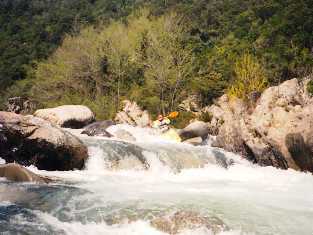 There are no convenient gauges to give river levels for the Travo, but an indication of the difficulties of the river can soon be obtained as the river drops immediately into a series of boulder falls running at grade 5-6 if the water level is good. The river is mostly at this grade for the first half of the river. 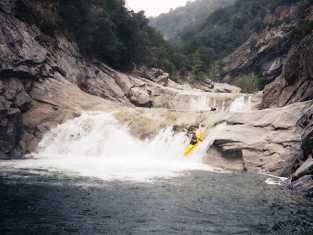 After about 2 kilometres the river bends sharp right and the famous waterfalls appear. The first three drops are in fact some of the easiest falls in the valley. They are best shot by aiming for where the water over the lip is the shallowest possible, thus aiming to land in the less powerful parts of the stopper. Take the first on the right, and the second on the left. The third (and lowest) fall is simple, but the final exit fall from the series has a tricky approach, but is fairly easily blasted straight down the right hand side. The Travo waterfalls- looking down on the second fall from the top of the first. After the grandeur of the falls the river does not let up, but continues with 3-4 kilometres of unrelenting grade 6-7 water. The one fall to watch is about one kilometre below the triple drop. 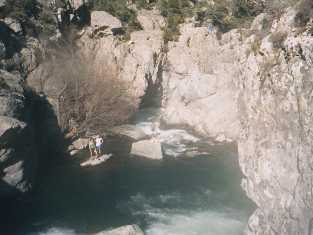 The river drops steeply both sides of two boulders jamming the gorge (which is about 6 metres wide here). More boulders in the bottom pool give a real risk of pinning. This fall has caused about 10 deaths over the years. 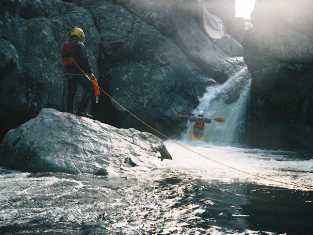 Portage on the left, seal launching from a platform about fifteen feet above the bottom end of the exit pool. This platform has a useful groove to guide your descent. 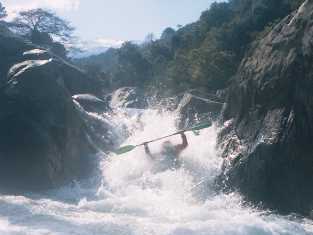 A pinning fall on the Upper Travo, and a site of various fatailities over the years. 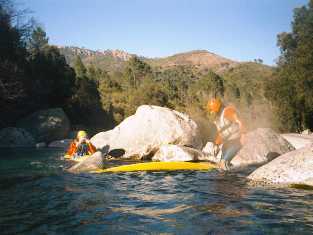 Portage is possible on the left bank, with a seal launch into the river below the fall. The river eases off only when the road comes into sight on the right, giving a grade 4 wind down for the last kilometre. Exit at the bridge, where wild camping is available and pleasant. The Travo from the D645 road bridge down to the coast is a pleasant grade 4 with the odd good quality fall. A very pleasant trip, and quite scenic considering it's proximity to the coastal civilisation. Get out at the bridge close to the obvious roundabout, rather than half a mile downstream at the coast road. The highest access approach for the Fium Orbo follows a small dirt track signed to Cavo from near Chisoni. As the road peters out in a small clearing past the hamlet, park up and follow one of the many paths down to the river. It starts as a pleasant grade 5 best at a level between 150 and 180 on the Defile des Strette gauge. A footbridge (visible from the A69) marks the only dodgy bit, a double drop totalling about 8 metres into a large cauldron. The first drop is normally portaged, but the second drop, called the Rocket, is especially photogenic. This second drop can be best protected by placing a man on the boulder in the centre of the cauldron, attached to a line held by a second man on the cauldron's edge. 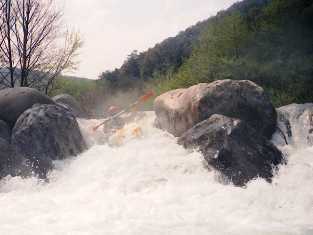 The river leaving the cauldron drops sharply and contains a nasty sump, so take out on river left from the cauldron, and portage. 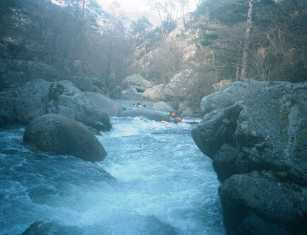 There is a strenuous carry for about 300 metres, until a steep path can be found leading down again to the river. From this point the river begins to ease up, running at mostly grade 3-4 until the gauge at the top of the Gorge du Strette marks the end of the section. 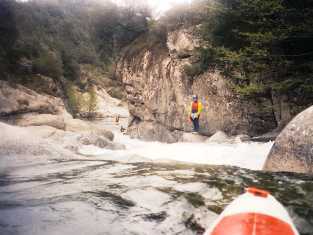 The next section of river is enjoyable and challenging, falling through a steep short narrow gorge with vertical sides in places. Some falls are tricky and very demanding, but many others are great fun, with many well defined fast chutes and breakouts set into acres of waterworn limestone. The river can be scouted throughout it's length from the road. 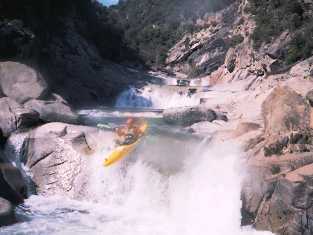 This is strongly reccommended as it is often impossible to clamber along the steep gorge sides to recce once on the river. Anything between 140 centimetres and 200 centimetres would be a good level, although the higher water levels might cause the odd portage. Grade 5, possibly 6 in high water. The gorge becomes steeper and nastier in the 400 metres above the Sampolo bridge. Recce carefully here and pick the exit point as appropriate, probably well above the bridge. Below the bridge the Inzecca Gorge is off the scale of even my revised grading system. Note that other parts of the Fium Orbo may well now be paddleable, depending on the progress with the hydro electric scheme. Many parts of the river used to give superb canoeing in years gone by, and may be worth another look now even if not described here. 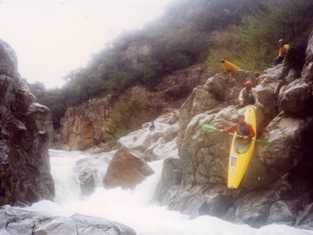 As the river descends in the valley it was mostly grade 4 to 5 although some sections are harder. 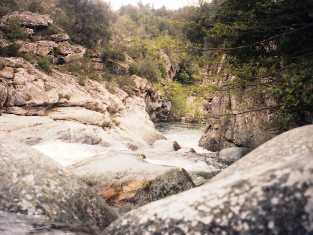 Once below St Antoine the mountains are left behind and the river becomes grade 2, with the difficulties coming from overhanging trees, especially if the river is high and flowing fast.